A Shogunate Elder connives to rule Japan by making his puppet, the Shogun’s brother Tsunashige, the next Shogun. The best strategist in Japan, Yamaga, leads a plot to stop the Elder, but his cabal is betrayed and most of the conspirators are captured and tortured. The audio is not surround sound as its made in 1964. It’s in Dolby Digital 2ch and the film sounds good for what it is. No hiss, no distortions or distortions on loud noises , its pretty clean. Compared to HD 7.1 surround sound I have to give the sound a mediocre rating. Not saying its bad just comparing the best to this film is all. The Video is in Black and white with a sparkling star effect throughout the film in the dark areas. The DVD quality stretched out on my 46″ is pretty good as skin textures look really smooth on close-ups. No pixelations but there is some distortion as in a Line going across the center of screen. Its thin and its like looking through glass, so on bright scenes on the faces you can see this if you pay attention. But most likely you wont notice it much as you will be reading the subtitles a lot. I only noticed it as I was scanning it with my eyes so I can Write about the Quality of the film lol. Don’t go and think it looks bad by my ratting, im just comparing this dvd to Blu-Ray quality. I’ve seen Blu-Ray black and white films with lesser quality. So this film looks pretty good for what it is. AnimEigo Did a great job with this. AnimEigo I think has the best Subtitles As they are in color meaning when some one else is talking in the film the text color will change to yellow or red or green so you know it’s not just the one person talking. The Great killing is similar to 13 Assassins, the plotting of an assassination. Like its predecessor The Great Killing is nothing but up Hill, its slow rolling but when the end hits it’s all hell infused in a Huge epic ending battle. 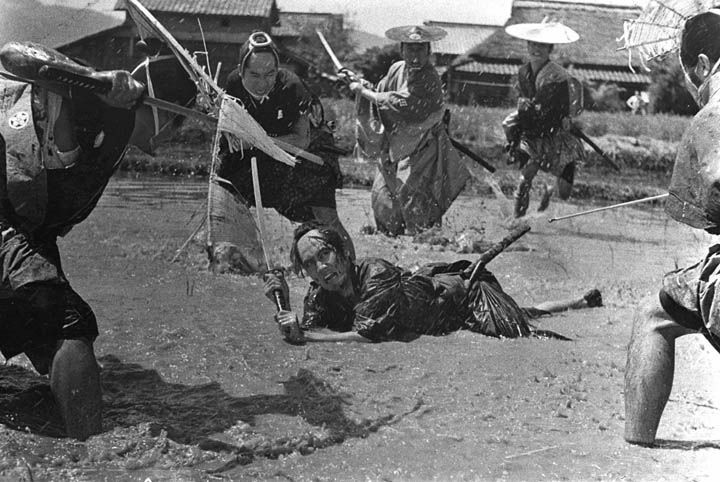 The battles are more realistic than a lot of other samurai films I think nothing flashy or blood spraying. Don t get me wrong I love that stuff but for this type of movie the reality is of it is great. I give The great Killing a lower score then the 1st film in the trilogy. The film didn’t have what I loved about the first film and that is its scenes of plotting and revising of strategies when some thing would change. The one thing I liked better than the first film was its ending battle. The battle starts out with mass confusion of Hundreds of people running and screaming as swords are being swung ether to defend and to kill the defender. It’s still a good film and is worth owning and the ending is always a great scene to watch.